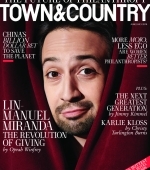 Lin-Manuel Miranda and his family are celebrated by the magazine Town & Country for their philanthropy work, infact they are the stars of the cover story of The Future Of Philanthropy issue. The interviewer is Pulitzer winner and Miranda’s friend Quiara Alegría Hudes. Under the cat you can read the interview. QH: Luz and Luis, you’re both so engaged and active. Was that always part of your relationship? Luis Miranda: Always. For our first date we went to see a group doing Puerto Rican protest music. It was not a fancy show. Luz says all the time, I should have known, given our first date, that life was going be a roller coaster. The first time we went out together, not on a date, we went to a march in DC to protest. Luz Towns-Miranda: It’s interesting, because before we met, both he and I were socially committed. In college I was part of the demonstrations in DC against the Vietnam War. I didn’t get arrested on May Day [during the 1971 protests] because cops thought I looked like a little kid. QH: Do you have to truly believe in a cause to get involved with it? Luis Miranda: You need to believe in the cause enough that you’re going ask others for resources. If you don’t believe in a cause, it’s very, very difficult. I learned a long time ago that you give until it hurts. If you’re not making sacrifices, you’re not giving enough. We will never ask someone to give time, resources, contacts, or money if we’re not willing to do it ourselves. QH: As parents, did you have a structured program for teaching your kids about giving and about community engagement? Luz Towns-Miranda: Absolutely. These kids got dragged to activities at the local nonprofits, the school board meetings, campaigning. It’s in their blood, because that’s what they grew up with. Luis Miranda: I learned this from my parents. Home was first. If your home is not in order, you cannot go and fix the world. For us, figuring out home and activism was always a challenge, because we worked very hard. We always had a couple of jobs that we were dealing with, but the kids were always part of the whole thing. QH: When you were younger, did you understand the importance of things like campaigning? Lin-Manuel Miranda: If there’s drudge work, it’s collecting signatures. We’d go to the projects on 10th Avenue, and we’d start at the top of the building and ring doorbells until we got to the bottom of the building. Next project, go all the way up, go down. Collecting signatures and handing out pamphlets for candidates for us was the equivalent of a paperboy job if you’re a kid growing up in the suburbs. Luz Miranda-Crespo: I hated that part! As I got older they would leave me in the campaign office, and at the end of the night, when they would start getting the polling numbers, I would have a spreadsheet. Luis Miranda: What I’m hearing is that you guys had a fantastic adolescence. QH: If collecting signatures was not the ideal situation, what do you remember as being something cool? Luz Miranda-Crespo: I would go to the galas in place of my mom. Any galas that she didn’t want to go to—if they weren’t someplace like the Waldorf-Astoria or the Plaza—then I’d be my dad’s date for the night. QH: Do you bring your kids to the kinds of events your parents brought you to? Luis Crespo: We’re blessed and, to a certain extent, trying to break their bubble every opportunity we get to do so. My wife does a good job; the kids know all the causes that we support. I’ve gotten such a second education being part of the family. Vanessa Nadal: There’s no way for the next generation, especially Lin and my kids, not to do it. We’ve generated so much wealth, and what else do you do with that? I don’t feel the need to drastically change my life and suddenly wear only designer clothing or take private planes anytime I go anywhere. QH: It’s interesting to think about the next generation being in a different situation. Their ability will be different from what you guys have, because there will be even more giving power. In some ways those dinner table conversations you’re going to have will have different repercussions. Vanessa Nadal: I find that there’s always this stereotype of the man who’s making the money and the wife who runs charitable organizations, and now I get it. It’s because it can be a full-time job to make sure that you’re donating to organizations that are using the money properly. I understand why that stereotype exists now. QH: If you’re not in a situation where you’re giving inherited wealth, how do you figure it out? How do you make your decisions? Vanessa Nadal: I always gave what I could every year to the organizations that meant something to me. I’d give back to Hunter College High School. I’ve been doing that since I graduated. It’s not much, probably like $100 a year, but that was always something that was important to me to do. Then I did the same at MIT, too. QH: In your family, what’s the difference between philanthropy and activism? Luis Miranda: I don’t see any. For the most part I believe activism and philanthropy are totally connected. What happened in our lives is that sometimes we didn’t have a lot of money to give, so we gave our human capital. Then, as our financial circumstances got better, it was easier to be active and give money. Luz Towns-Miranda: My family is very different in that my father was middle class and my mother was very poor. When we would go visit her family members in the projects in really awful circumstances, I would feel this sense of difference and pain, feeling like I knew they had less than us. I’ve always worked in very poor communities as a result. QH: For the second generation, is there a connection between the generous energy that your parents have with their community engagement and your own creative generosity? Lin-Manuel Miranda: I think the relentlessness is our birthright. My sister and I have talked about this a lot. One of the things that we both had trouble with in high school, when it came to relating to our fellow adolescents, was the notion of hanging out. That was not a thing we were good at. It was, like, So we’re just gonna sit here? I think, because our parents were so active all the time, that felt somehow like cheating. Luz Miranda-Crespo: We needed a purpose, and they needed to know where I was. I remember if I wanted to stay after school, I’d have to get a quarter and call their offices and hope that they were there. If they weren’t, I had to go home. QH: It seems as if the family trade is civic engagement, but in terms of your actual trainings, they’re all disparate. Lin, is #EduHam the kind of thing that you could have done in isolation, without your family members, or did you actually need them? Lin-Manuel Miranda: Everything I did prepared me to write Hamilton. And it’s almost like everything Luis Miranda has been doing all his life prepared him for #EduHam. As soon as we knew Hamilton was going to be a hot ticket, we realized we had to prioritize kids or we’d have lost. Because if this is the kind of thing where only the richest people can go to see it, and kids aren’t prioritized, this is not gonna happen. Because my dad has worked in the not-for-profit sector and the for-profit sector, because he knows how the school system functions, because he’s worked with national campaigns, it was the perfect gig for him. Luz Towns-Miranda: The #EduHam program has really been a dream of mine and of Lin-Manuel’s since he was a teacher and he saw the difference a teacher could make. The idea that these kids were being given an opportunity to develop their own creative ideas around a true historical event and then see Hamilton—kids who would never have gotten to see a Broadway show—I think it’s life-changing. QH: What has your experience been like of marrying into a family that puts such an emphasis on philanthropy and community engagement? Vanessa Nadal: It’s inspiring that there’s a family that spends so much of their time giving back to the community. I feel like Luz and Luis do it so much that it’s not a second thought for Lin. Writing the two charity songs that he’s done and giving his profits away—it’s not even a question. Lin-Manuel Miranda: Vanessa has a science background—she went to MIT and worked for the Climate Science Legal Defense Fund—and when Hamilton went to London, we thought it was a nice international issue. Do you know Prizeo campaigns? They’re a way to raise funds for organizations we care about with a raffle. The grand prize was to get to see Hamilton opening night. So we partnered with London-based organizations that help with ­climate science. QH: So much of what you do includes an aspect of giving—even TeeRico, your merchandise store. How did that get started? Luz Miranda-Crespo: We noticed that there was a lot of unauthorized merchandise online, and it upset us. There was clearly a demand, and we felt we needed to take control of this brand. People want stuff with Lin-Manuel’s name on it, but I think Luis had to pitch you a couple of times. No, Lin-Manuel? 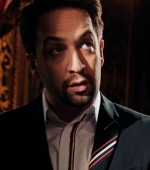 Lin-Manuel Miranda: Yeah, because I just want to write. 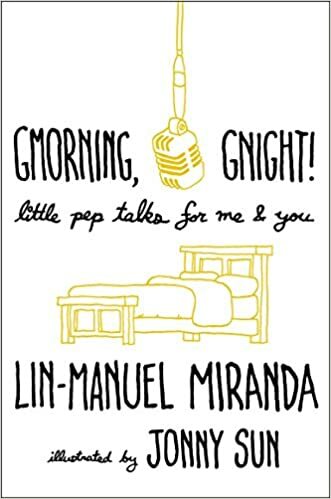 Lin-Manuel Miranda: The pitch was that the fans were already making art, so let’s engage them as opposed to hiring illustrators who don’t have any connection to this. 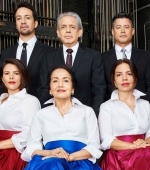 Luis Crespo: Then, working in parallel with the philanthropic activities that Lin-Manuel and his father were doing anyway, this was just a vehicle to give more to the causes that we were supporting. QH: In addition to being philanthropists, you’ve also been the recipient of philanthropy. I’m thinking about the MacArthur Grant, the Kennedy Prize, the Pulitzer Prize that Lin-Manuel has won. How has that helped you? Lin-Manuel Miranda: I got the news of the Genius Grant the week after we had paid off Vanessa’s law school loans. We had literally just finished paying down our debt, and then the next week this incredible vote of confidence comes in—it’s just a week too late to actually help us with our financial needs. Then it becomes about paying it forward. That’s always what we think of, whether it’s the Kennedy Prize or MacArthur—it’s about, What is that money going to do to further the goals of the people who have honored you and continue your work? Video: What Do Lin-Manuel Miranda and Gizmoduck Have in Common?